Seen this eyesore last Saturday 16th February. No words can describe how awful this.is ..Just one question how did the idiots get this to the summit of a 286 metre Hill ? 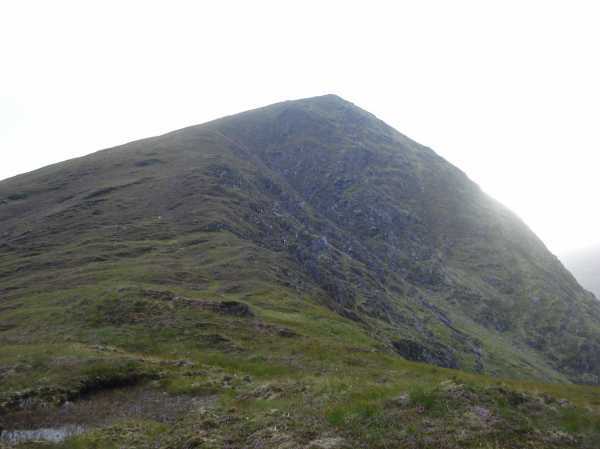 Ó Cíobháin gives Beann, 'peak', as the true name of this mountain. 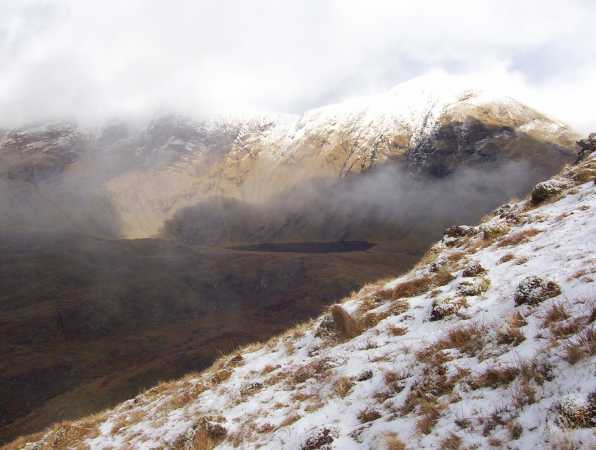 Apparently the name Bruach na Binne really belonged to a feature a few miles to the W overlooking the Bridia Valley and was mistakenly applied to this peak by the sappers. Broaghnabinnia is the 82nd highest place in Ireland. Broaghnabinnia is the most northerly summit in the Dunkerron Mountains area. Steep sided, flat topped and great views. Since adding the comment, I have located my copy of Richard Mersey's 'Hills of Cork and Kerry' to see what he thought. For me, Mersey is a wonderfully evocative writer, that practical approach of a bygone age when mountains would be tackled in flannel shirts, tweed pants and sturdy shoes, with a couple of oranges and a pack of Sweet Afton for sustenance. And his book is a great mix of folklore, amateur geology and local history. Anyway, he ascended Broaghnabinnia from the Bridia Valley side, and he described the climb as 'steep and invigorating', but he too found the top 'a real anti-climax after the alpine ascent'. So clearly Herman isn't alone in his view. Most surprised to read of David Herman's comment, I really like this mountain. For starters it is pleasing on the eye, it rears above both the Black Valley and Bridia Valley and stands out from its larger neighhbours, while those around it of a similar height like Brassel, Knocknabreda and Curraghmore seem content to hide amongst the Reeks and Iveragh Mountains. Parked car at V8175 8218 A where road twists around a shed. There is parking for 4 or 5 cars here, and many more spaces a few hundred yards further down the road. Crossed 2 sheep wire fences each with one strand of barb wire, very easy mind, and made way across the Cummeenduff River. Fording was tricky, the water was only ankle/knee height in the dry weather but the rocks all seemed very soapy and had to be careful not to slip. However, the maps show a road to derelict houses further south which road seems to cross the river, so perhaps in bad weather use could be made of that route. From there made my way to point V8187 8171 B at the foot of a stream/waterfall which clearly scars the broad east/south east rump of the mountain behind the derelict houses. From there, spent 50 minutes making my way up a very enjoyable scramble to a broad shoulder at V8134 8154 G as shown on the right hand side of Simon3's photo. Loved this part of the trek. The stream was dry, but room on both sides for wetter times of the year. Lots of sweat and lots of midges, so don't forget the repellent. Excellent views from that shoulder over the Black Valley, across to Stumpa Duloigh and north to the huge wall of rock above Curraghmore Lake and under Caher and Carrauntoohil. From the shoulder one has a clear view to the apparent summit in the middle of Simon's pic and that is gained by a 15 minute walk across springy turf and heather. However, as is evident from that photo, this is a false summit, there is another good ten minutes of effort required before one makes the top - perhaps it was this false summit that frustrated David Herman. More excellent views, including a vista right down the length of the Bridia Valley and on to Mullaghanattin and the mountains around Glencar and Glenbeigh. As night was closing in I had to descend at pace. Retraced my steps to the shoulder, but stayed more to the north of it this time and took a ramp from it at V8126 8160 H that leads almost due west across the east face of the mountain, descending all the time. From V8097 8176 I, made a beeline for the car. A few crags to negotiate, but made it down from summit to car in 50 minutes - though was on my own and moving fast. Again, care needed fording the river. 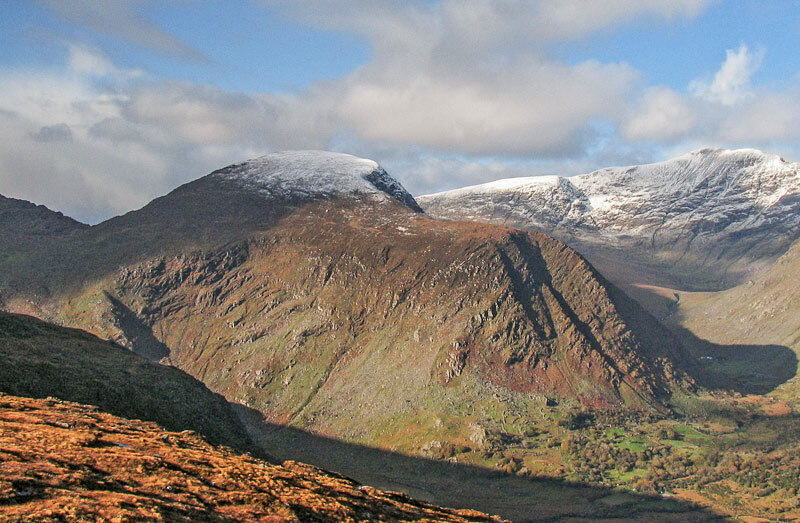 Picture from simon3 : White flecked summit from the west. Picture: White flecked summit from the west. Climb the nose of a westerly face. Broaghnabinnia can be climbed from the west in the Bridia valley. There is a limited amount of parking for example around V7840 8156 J. The attraction of this route is the long rocky nose shown in the photo. This is around 1000m long and climbs around 525m (gradient 50%+ !) which I can attest is hard work, but then reaching the top by any route from north or east is also very steep. Few guidebooks describe this route. 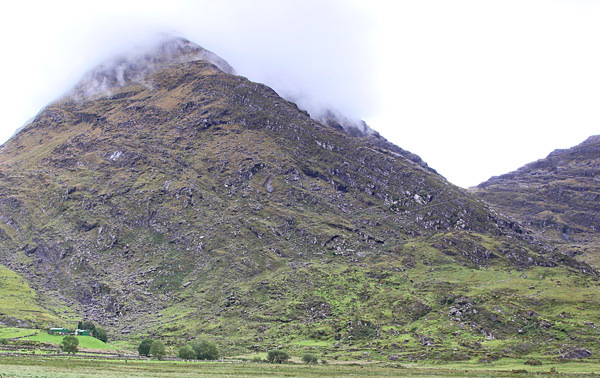 I did find this in Claude Wall's Mountaineering in Ireland: "The northern outpost [of what he calls the 'Breadagh district'], Broaghnabinnia, a cone of steep grey rock, is a stiff climb, but is more remarkable for the great rough image of a human face weathered on its western flank, which changes expression according to the viewpoint." Picture from simon3 : Broaghnabinnia, SE side. Poor old Broaghnabinnia. Described by David Herman [Hill Walkers Kerry] as ".. not the most enticing of mountains .." whose summit is ".. a tiny plain of boggy grass .. disappointing .."
Can't say I entirely agree. This summit has some dramatic slopes particularly on the northern side. Even this picture of the southern side shows cliffs and steepness.